Peter Jackson welcomes us back to Middle Earth, this time bringing to life J.R.R. Tolkien’s children’s fantasy novel, The Hobbit. Set against sweeping natural vistas, The Hobbit is a classic adventure tale that unfortunately suffers from being split into three parts. However this lengthy first instalment still bristles with cracking fight scenes and death-defying escapes as Bilbo Baggins (Martin Freeman) joins Gandalf (Ian McKellen) and a band of rowdy dwarves on a quest to rescue a lost dwarf kingdom from a marauding dragon. British actor Freeman (The Office) is an intriguing choice as the young Bilbo, but he imparts an endearing sense of bemusement to the fish-out-of-water role – such as when he embarks on the adventure with his heavily armed comrades and panics when he realises he has forgotten his pocket handkerchief. Considerable effort has gone into endowing the 13 dwarves with distinguishing features – a room full of squat, hairy, beer-quaffing men have a tendency to blend together. 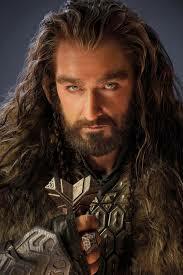 The more memorable characters are the rotund Bombur (Stephen Hunter), quirky Bofur (James Nesbitt) and the devastatingly handsome leader Thorin, (Richard Armitage), who exudes a smouldering sexuality (pictured) that I don’t recall from the book. Some old favourites from LOTR make a reappearance; Cate Blanchett shimmers as statuesque elf queen Galadriel, Hugo Weaving maintains a haughty grandeur as elf lord Elrond, and veteran bad-guy Christopher Lee makes a sinister cameo as the wizard Saruman. Gollum (Andy Serkis) features in one of the film’s best scenes when Bilbo stumbles across a mysterious ring in a cave and is forced into a deadly game of riddles with the twisted creature to survive. The jolly tone of Tolkien’s original work is evoked in scenes of the dwarves carousing and a close encounter with the grotesque Great Goblin, played by Barry Humphries. However, the terrifying Orcs astride hyena-like Wargs may frighten younger children, so the M rating is well warranted. While the cracking pace is often weighed down by lengthy dialogue, the charm of the original story shines through, mostly due to the wonderful set design, the obsessive attention to detail that characterised The Lord of the Rings, and the talented Freeman and McKellen in the lead roles.